Here is a outline of the overall programme of the ISUS summer school, main conference and satellite workshops. 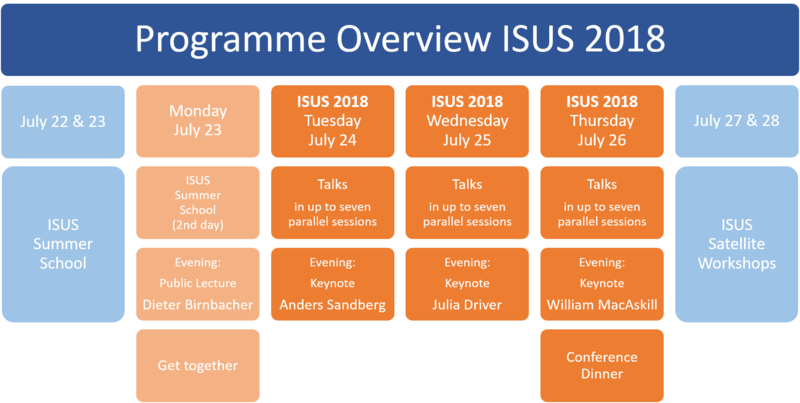 The ISUS summer school will take place on July 22 and 23. For more information, please click here. 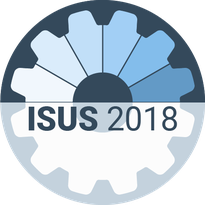 The ISUS conference will be opened by a public lecture by Dieter Birnbacher (Düsseldorf University) on July 23 (in German, English text will be provided). The public lecture will take place in the evening at the Karlsruhe Palace. For more information, please click here. For a list of the accepted talks and abtracts please click here. For a list of the accepted panels please click here. The registration at the main conference venue (Otto-Ammann-Platz 1, 76131 Karlsruhe, KIT Campus-Süd, Building Nr. 10.80) will be open from 8 am at the first conference day. The conference will start at 9 am that day. On each of of the conference days there will be a keynote lecture in the early evening. The conference dinner is on Thursday night. The satellite workshops will take place from July 27 to July 28. If you have any questions concerning the programme please don't hesitate to contact us.